In celebration of our new exhibition The Senses: Design Beyond Vision, this Object of the Day post explores the multisensory experience of an object in Cooper Hewitt’s permanent collection. The invention of the incandescent light bulb in the nineteenth century not only advanced technology, but also design, especially into the twentieth century. This bulbous, blown glass table lamp demonstrates one way in which designers have continued to play with incandescent light in order to alter the qualities of a space and affect our productivity and mood. Designed in 1956 by the prolific designer, Massimo Vignelli, the one-piece body of this Fungo (Italian for “mushroom”) lamp consists simply of of alternating translucent thin vertical white and orange stripes of fused glass canes blown into this curved form. Upon moving from Milan to Venice to study architecture in 1953, Vignelli started working part-time for Paolo Venini, the founder of the Venini Glassworks. The firm, known particularly for its modernist glass of the mid-twentieth century, was looking for someone to develop their lighting fixtures, a role that Vignelli filled, designing glass lamps until 1957. Working glass involves many laborious techniques. Vignelli’s exposure to the making of glass wares in Murano gave him a passion for exploring the material and its properties. Much of the Fungo lamp’s appeal stems from its use of glass and the material’s effect on shaping light. Vignelli explained that, “It was a very challenging proposition to bring colorful Murano glass into play with light. 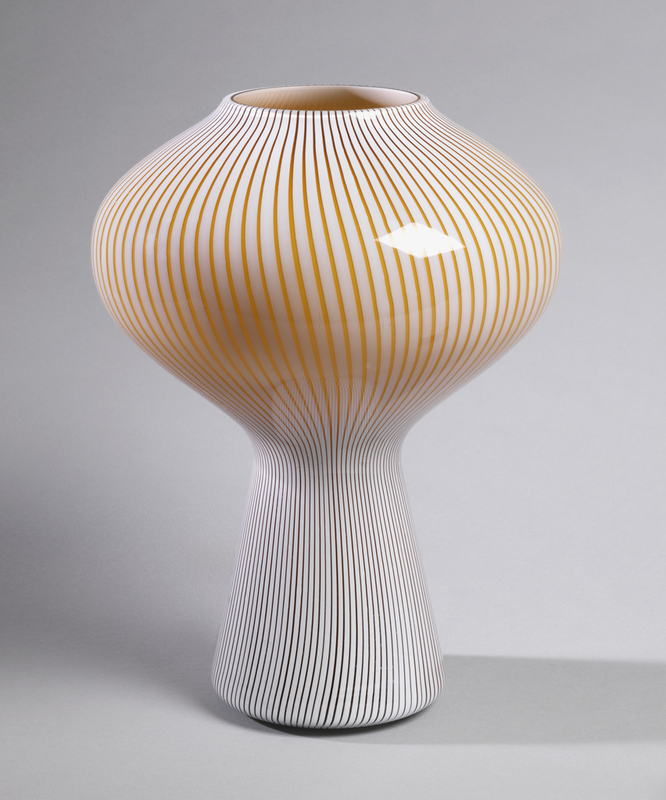 This lamp was the result of an attempt to eliminate the need for a lamp shade by merging base and top, using typical Murano glass.” The singular outline of the mushroom-like lamp’s convex cap and tapered stem creates a pleasant curve and purposefully merges the lamp’s base and top into a single unified form. The ultimate result is a lamp that, once illuminated from within, glows and catches our attention with its elegance, vibrancy and simplicity of line—a design largely influenced by Vignelli’s minimal aesthetic. The light passing through the colored glass stripes gives the impression of a warm and vibrant ambience appropriate for intimate settings. The Senses: Design Beyond Vision is on view at Cooper Hewitt through October 28, 2018. Mija Riedel and Massimo Vignelli, “An Interview with Massimo Vignelli (1931-2014),” Archives of American Art Journal 53, no. 1/2 (2014): 86. http://www.jstor.org/stable/43155544 (accessed February 10, 2018). Massimo Vignelli cited in https://vignelli.com/home/product/venini4.html (accessed February 10, 2019). A beautiful lamp. Today I bought her twin .